Prometheus brought fire from the Gods to the masses. Forge Nano’s Prometheus R&D tool brings the power of particle ALD to the masses of academic, corporate, and national laboratory scientists keen on pushing the limits of high-performance materials through surface engineering. The Prometheus Series signifies a major step forward for R&D into the application of sub-nano to nanoscale coatings on powder volumes from milligram to kilogram samples. Forge Nano’s Prometheus Series was engineered to help scientists accelerate their understanding of the coating design space between current and novel precursors and different substrate materials. 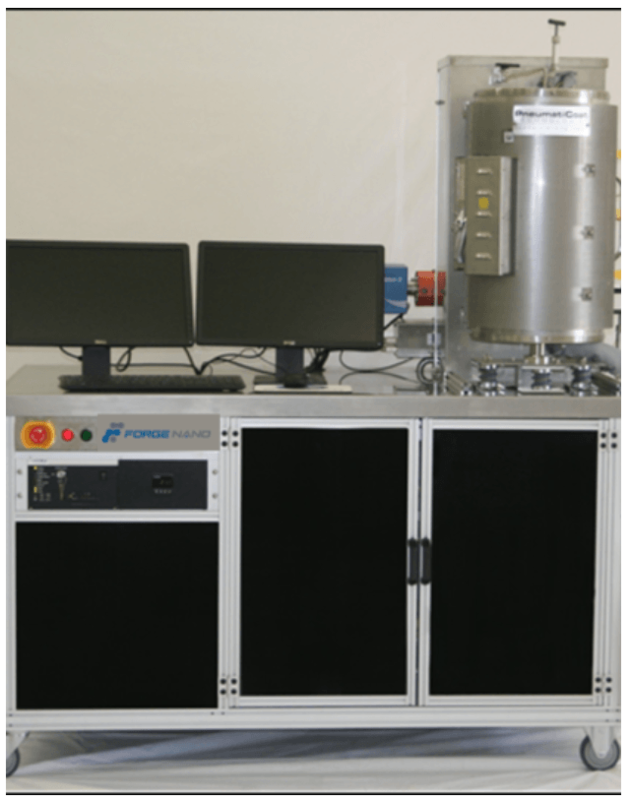 These systems house up to eight precursors, including standard delivery and low vapor pressure delivery draw systems to handle solid, liquid, and gas and precursor recipes with complete ease. Individually-heated zones throughout the system ensure ideal operating conditions for sensitive substrates and precursors. This novel ALD R&D tool is equipped with a number of fluidization aids to ensure particles are sufficiently fluidized for even coatings. The vibrating fluidized bed reactor and high shear jet help the negation of powder aggregation and enhance mixing in the reactor. Highly controlled dosing is aided by high degrees of automation and automated process monitoring. The system is fitted with emergency stop logic to enable the ALD system to function safely, continuously, and autonomously. The user interface is also intuitive and user-friendly for easy implementation. The Prometheus Series is the world’s most flexible ALD R&D tool, and it was designed with the researcher in mind. It offers the most advanced software and hardware for control and in situ analysis of ALD coating in real-time. Forge Nano’s Prometheus Series has a number of available models and a range of options to provide the correct fit on technical capabilities while keeping in mind the researcher’s budget. Corporate researchers, academic partners, and government laboratories all stand to gain from this unique, flexible ALD research tool, which was built to cover a broad range of research areas. Customers of Prometheus will have control over the cost, speed, and ownership of their IP efforts. Forge Nano also offers widespread scale up resources to translate the customer’s lab-scale innovations to high volume commercial markets.